The technology in our homes takes on a wide array of jobs: playing music, turning lights on and off and brewing coffee. One of the promises of the internet of things is that all of them could one day communicate, creating smarter homes that anticipate and meet our needs with minimal effort. There are already systems for bringing connected devices into one central control center, but most of them resemble the remote controls we have used for years to manage our TVs and stereos. Siri has a voice, but does little to convince us that it is more than a computer talking. Jibo, the first robot by a Cambridge, Mass., startup with the same name, is built to bring a body and voice to our electronics. 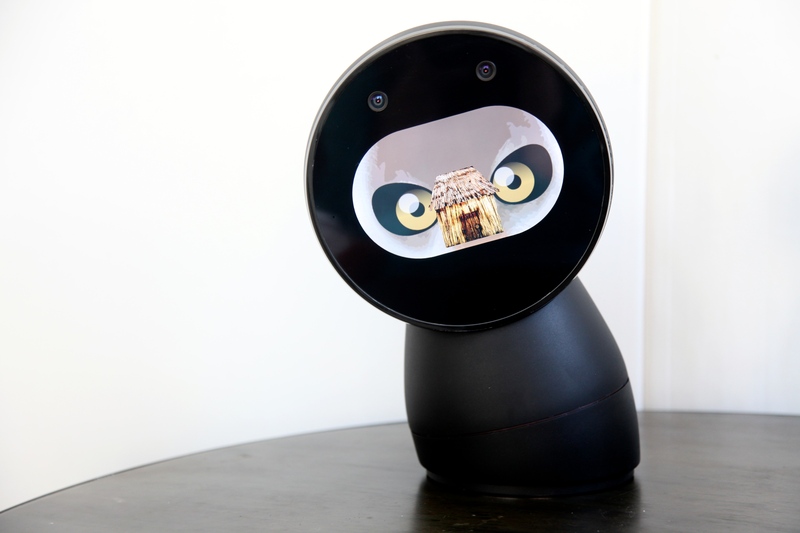 CEO Cynthia Breazeal, who is also director of the Personal Robots Group at MIT Media Lab, put years of work in social robotics into Jibo, resulting in a device that is meant to hit us exactly where we are most human: our emotions. Breazeal described Jibo as “warm” and “part of the group.” It is distinctly a piece of technology, but is built to blend into everyday life and conversation. It can display a distant relative’s face on its screen during a video chat or read a book to a child. During a demonstration, Breazeal held a short conversation with Jibo. “Jibo, how are you doing?” she asked. “I’m great, thanks for asking,” Jibo replied. Jibo then launched into an explanation of its skills: relaying notifications, acting as a telepresence screen, dramatically reading a book. The startup would like to see developers pair Jibo with connected devices. A Nest thermostat would still do its job of tracking your patterns and adjusting your home’s heating and cooling, but Jibo would act as its face. Instead of programming the thermostat through your phone, you would just ask Jibo to take care of it. 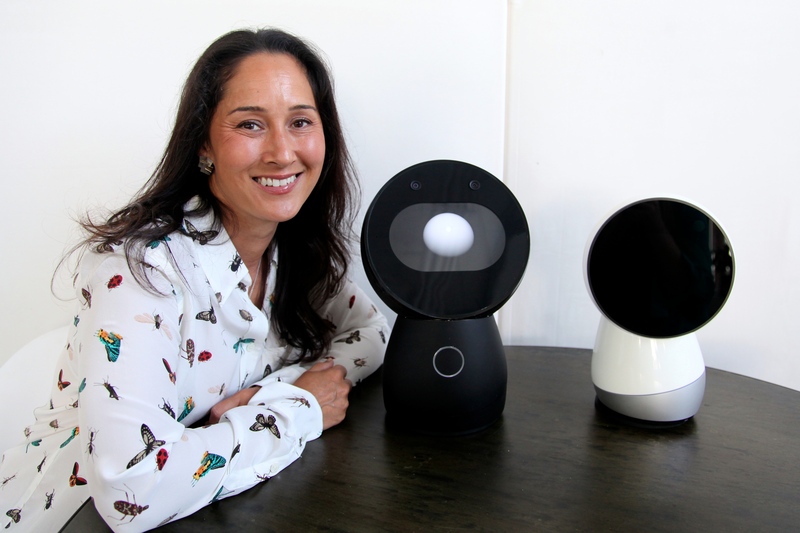 CEO Cynthia Breazeal with a Jibo prototype, left, and a mockup of what the final design will look like. Photo by Signe Brewster. A humanoid robot in the image of C3PO that takes care of all of our needs is still decades away. Instead, a series of robots that perform specialized tasks like cleaning our grills and brewing our coffee are emerging. They aren’t very personal. That makes room for a sort of “robot butler,” as Silicon Valley Robotics managing director Andra Keay recently described to me, that bridges the disconnect between human and machine. Jibo looks simple: a half sphere sitting on a cylinder. It is black, white and gray like any piece of technology these days. But it still manages to ooze emotion and a noticeably cute persona with its voice and carefully designed motion. Breazeal noted how Luxo Jr. –Pixar’s animated lamp character — conveys story and a personality just by the way it moves. Like Jibo, it has no face or humanoid body. Jibo does a dramatic reading of a story. Photo by Signe Brewster. A limited number of Jibos are available for preorder on Indiegogo for $499. The developer version costs $599. Consumer Jibos will ship to backers in 2015, with a full rollout in 2016. As more and more Jibos go out to consumers, Breazeal said she would like to see it helping people live their everyday lives. It could someday be used for therapeutic and educational applications, or to help an elder maintain their independence. Another way robots are coming into the home are with health care as our population ages and there are less young people to care for the elderly. For examples, see http://www.mhealthtalk.com/2014/06/healthcare-robots-2/. lolzz! you owned it man ! Without this comment, article is incomplete !